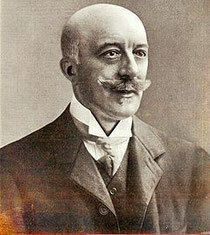 Cyriel Buysse was born on 20 September 1859 in Nevele, Belgium. He studied at the Atheneum in Ghent. Then he joined his family’s chicory factory at his father’s wish. His aunt, Virginie Loveling, who was an author herself, made him start writing at the age of 26. When his father found out that he dated a girl from a local bar, he had to leave his home. He left for the U.S.A but came back even more disillusioned. Being back in Belgium, he wrote a novel, named Two memories from America in 1888. Buysse became well-known as a naturalist writer in the tradition of Stijn Streuvels, Emile Zola and Guy de Mauspassant. He has been educated in French, which was common for sons of wealthy Flemish families, most of his work is in Dutch. He co-edited the literary periodical "On Now and Soon" in 1893 together with Prosper Van Langendonck, August Vermeylen and Emmanuel De Bom, but soon he left after an argument. In the same year, he wrote his first novel "The Law of the Jungle." Buysse married the Dutch widow Nelly Dyserinck in 1896 and spent the winter in the Netherlands, his son René was born there in 1897. In 1903 he co-founded another literary magazine, Groot Nederland with Louis Couperus and Willem Gerard van Nouhuys, which he continued until his death. He became an active contributor to the newspaper, "The Flemish Voice." In 1918, he returned to Belgium where his talent was now widely recognized. He received the state prize for literature in 1921, he became a member of the Royal Flemish Academy of Language and Literature in 1930. Buysse died on 25 July 1932 in Afsnee, Belgium.